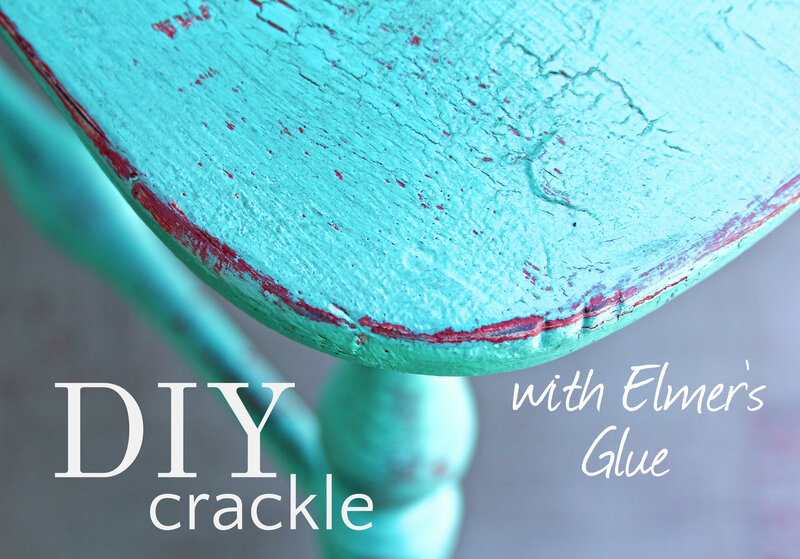 I have been told by other DIYer’s that Elmer’s glue will work as a crackle medium on furniture instead of various more expensive crackle products. I experimented with several varieties of glue and found that many worked well, from generic white glue to Elmer’s brand. I had never tried this alternative as I had also heard that it works only half of the time, besides, if this were true, why are there so many crackle medium’s available in home-improvement stores and wouldn’t this little secret be out by now? I continued to purchase crackle medium thinking I did’t want to waste time with something that only worked sporadically. In fact I wanted to start selling crackle medium in my store along with the other great paint products and brushes I already carry so I asked on Facebook what the best crackle medium on the market was? Again I was told that Elmer’s glue works as a crackle medium and there was no need to pay more for other products. At this point I decided to investigate, make a video, and put Elmers glue to the test. 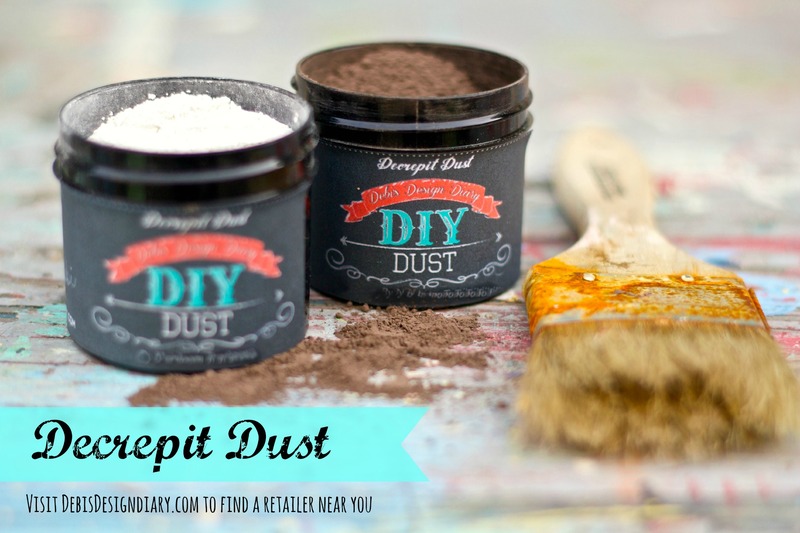 I also wanted to try out our new DIY Aging Dust. 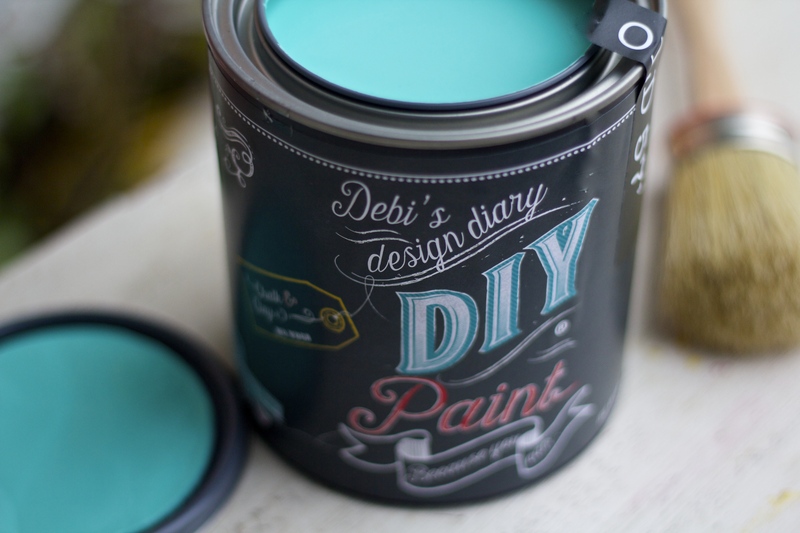 This is something you can use instead of dark wax, it comes in powder form and you sprinkle it into the detailed areas of furniture to get just a little bit of age into your project without having to wax the entire piece. Here’s the video I created, demonstrating how Elmers glue transformed this $5 yard sale chair. 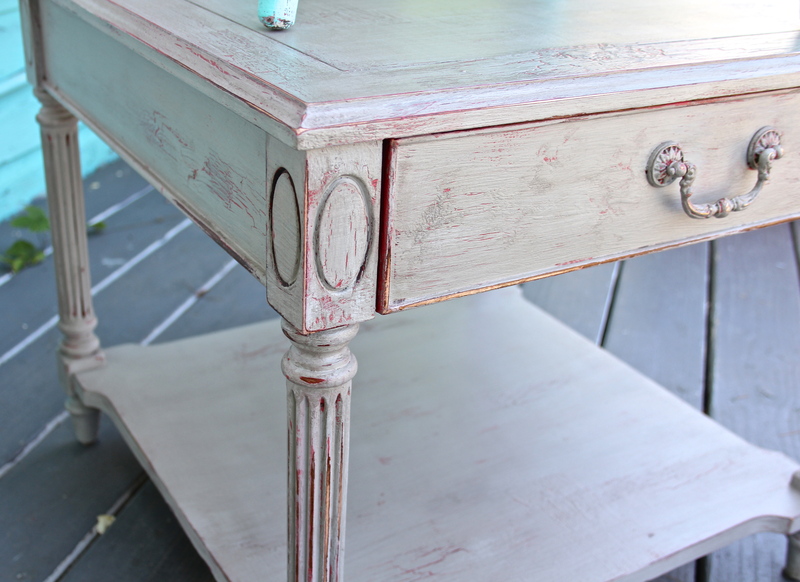 I was so happy with the crackle process that I also painted this end table. -The thickness of the glue will determine how pronounced your crackling will be. 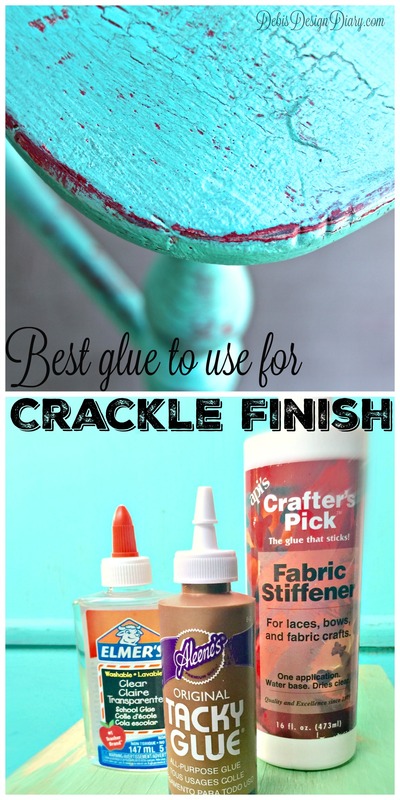 A thin layer of glue produces tiny cracks and a thicker layer will create larger cracks. – After you apply the glue and are going over it with your second coat of paint your brush will drag and feel funny, the temptation is to correct your brush marks, however you don’t want to do this as it will interfere with the crackling process, instead wait for your second layer of paint to dry completely, and then touch up your brush strokes after the crackling has appeared. -If you end up with more crackling than you want, you can lightly add a wash of paint to make it appear more subtle. -Although I have not tried other brands of white glue, I’ve been told they work as well Elmer’a glue. A friend of mine says she uses the white school glue from the dollar store all the time. I will be offering a new class that will include some specialty finishes such as crackling, glazing and stenciling, along with my paint 101 classes this summer! 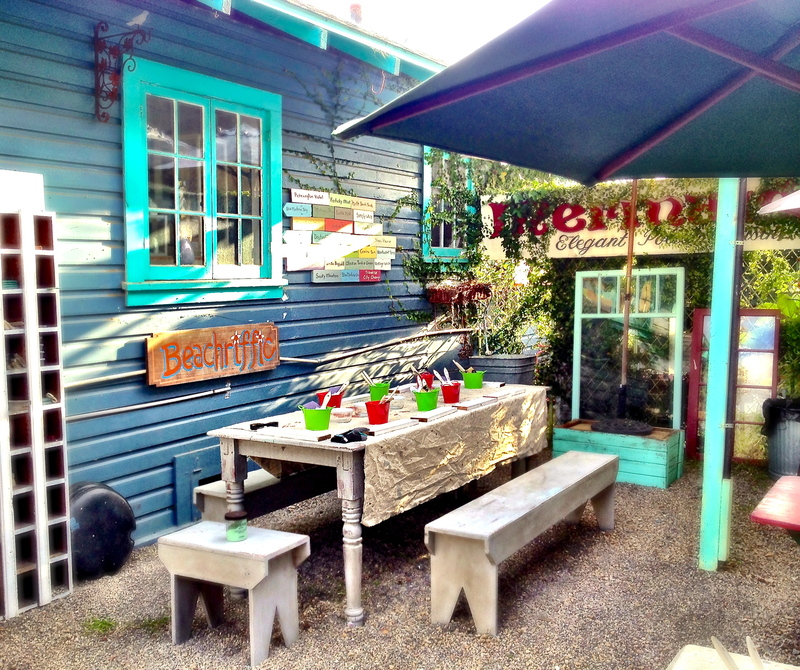 I am so excited about the new classes we have been offering at my store here is a photo of our outdoor classroom area! Hope you can join us, I would love to have you! Thanks for the crackle ideas saved me some pennies ! What paint is best to use or doesnt it matter? hi Elba! 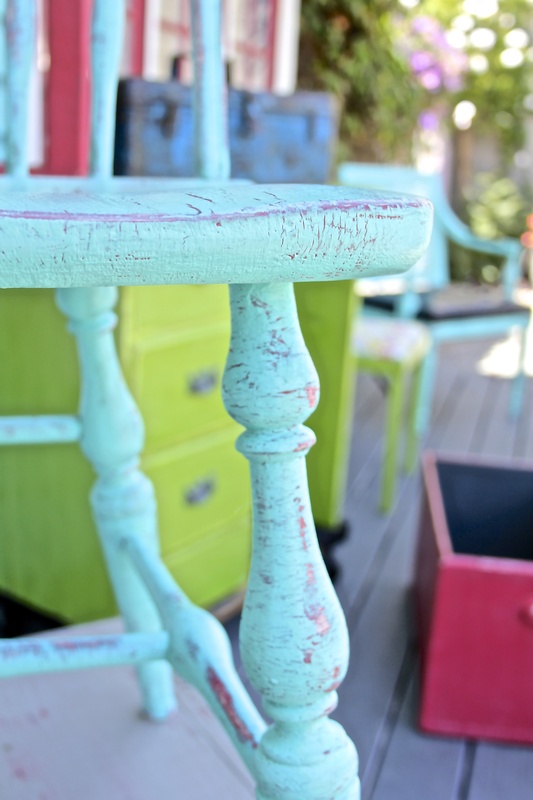 most paint should work, I used CeCe Caldwell because it’s awesome and easy:) If you have a specific paint you want to try, I would do a test on a scrap piece of wood first. It didn’t crackel? What did I do wrong? I read somewhere you need the original formula that says glue-all , I think, or wood glue. I’m about to try it with wood glue. Also, painting the glue on in a “X” like motion, fairly thick seems to work the best. Hi, i already waxed a piece and now want to and some crackle. Can i still do so over the wax?